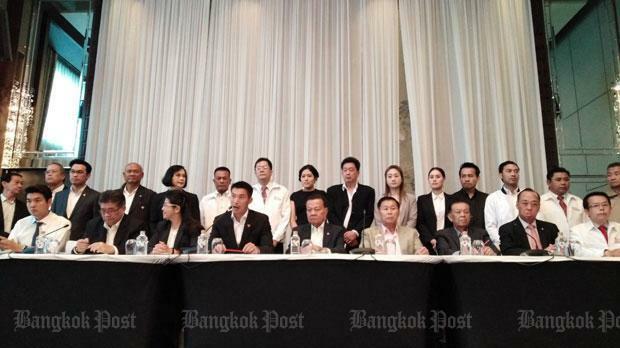 BANGKOK: The Pheu Thai Party today (Mar 27) announced the formation of a seven-party coalition government with 255 MPs, vowing to stop the National Council for Peace and Order (NCPO) returning to power. Khunying Sudarat Keyuraphan, a candidate for prime minister, said Pheu Thai and its six allies stood firm in their determination to prevent Gen Prayut Chan-o-cha remaining in power. The pro-democracy parties had the mandate to form a coalition government, she stressed. Also present at the news announcement at the Lancaster Hotel, opposite Pheu Thai Party headquarters on Phetchaburi Road, were representatives of the Future Forward, Thai Liberal (Seri Ruam Thai), Prachachat, Puea Chart, Thai People Power and New Economics parties. However, only the leaders of six parties were present to sign the agreement. Future Forward leader Thanathorn Juangroongruangkit echoed Khunying Sudarat on their intention to remove the NCPO from power. He also said any attempt to form a minority government in the House would would lead only to chaos and deadlock. Prachachat Party leader Wan Muhamad Nor Matha said the formation of a government with a minority of seats in the House would be in disrespect of the people’s voice. It would not be stable and would affect the national economy. A 7 party coalition sounds very nice, if they can find each other and go together forward. But what thai democratic fist can they make, as long NCPO/Junta is in full control of the appointed ( not choosen) Senate?